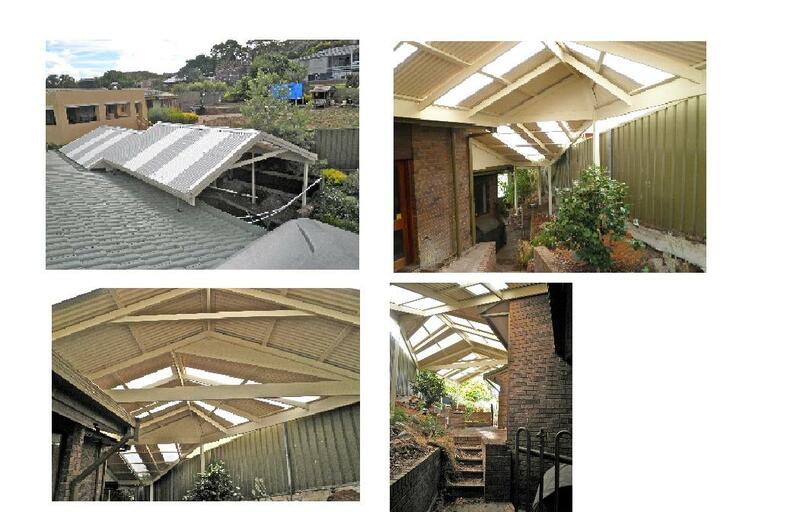 Coming from a carpentry background and having worked with Outside Concepts for eight years enables me to build very interesting and sometimes challenging structures such as decks, pergola’s, carports and verandah’s. This structure consists of four verandah’s joined seamlessly together to connect the entrance from the carport through to the view of the swimming pool. It pays to have a good relationship with your builders when taking on a project like this, something we value. There are two pitched areas, plus a skillion ( steep flat angle ) and a flat section. The framework was built using treated permapine timber and galvanised steel posts with corrugated colorbond roof sheets and Suntuf Polycarb skylights. Due to the different levels on the property and the fence running on an angle, we chose to use roof extenda brackets to the first section to obtain good height for the gabled entertainment area. The use of Lysaght Colorbond and diffused polycarbonate roof sheeting has created sufficient light and coolness to the barbecue below. The ground level drops down 1200mm from here, allowing the skillion roof to join the gabled verandah and a flat entrance from the existing carport. The design gives a very spacious and open feel to the narrow thoroughfare leading up to the main dining and entertainment zone, a perfect place to enjoy good food and wine with friends and family. We are proficient in building this kind of job using timber or colorbond steel , and wise and experienced enough to help you decide which materials will suit your home and budget. I enjoy the challenge of designing exciting projects that will enhance your home. If you want a professional first class job and a great experience during an important addition to your life, then please give us an opportunity to show you what we do. Don’t delay need the experts call today 1800 601 674 for an obligation free quote.